We have installed several platforms of instrumentation around London to observe the urban climate – latest data available here. An Eddy Correlation system was installed at 190m on top of the BT Tower, consisting of sonic anemometer (Gill R3), infra-red hygrometer (Licor Li-7500), net radiometer (Kipp and Zonen CNR4) and weather station (Vaisala WXT520). Eddy correlation systems measure vertical turbulent fluxes inside the atmospheric boundary layer. The compact weather station measures wind speed and direction, air temperature, humidity and precipitation. An Eddy Correlation system was also installed at 18m on top of Westminster City Council (WCC) House, consisting also of sonic anemometer (Gill R3), infra-red hygrometer (Licor Li-7500), net radiometer (Kipp and Zonen CNR4) and weather station (Vaisala WXT520). Eddy correlation systems measure vertical turbulent fluxes inside the atmospheric boundary layer. The compact weather station measures wind speed and direction, air temperature, humidity and precipitation. Lasers (Doppler lidar) and sound pulses (Urban sodar) are used to probe the air above the buildings at a distance. When the laser or sound interacts with aerosol particles, the reflected signal is received by the instrument providing information about the movement of that particle. This provides profile ‘images’ of air movement around buildings at a level of detail that is not attainable using anemometry alone and allows for the characterisation of turbulence in the urban boundary layer. 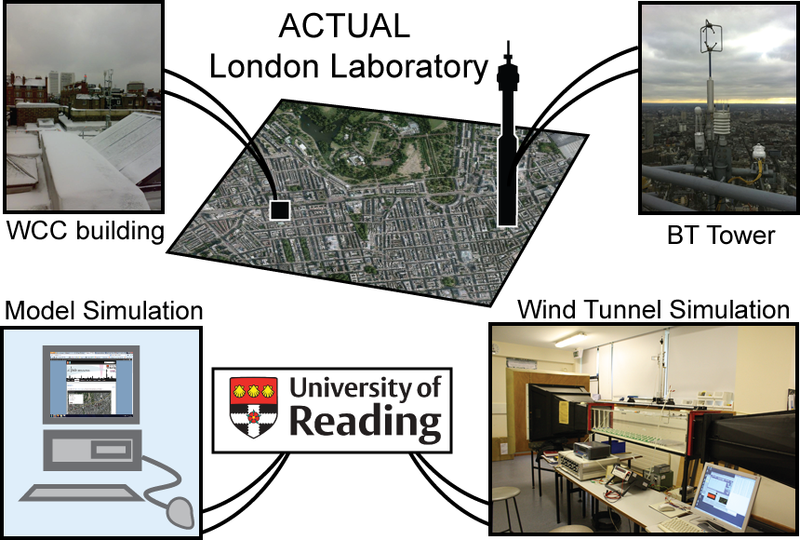 The Wind-Tunnel at the University of Reading has dimensions of 150×23×23 cm. A fan moves air past lego bricks used to represent buildings. The wind tunnel generates a boundary layer at 1:2000 scale. Analysing the flow of air and/or heat around the lego bricks and the interactions with the boundary layer that is created provides information on expected flows in a full-scale urban environment. We collaborate with Alan Robins at EnFlo.